Is your landscape going to the dogs? Is your lawn grass riddled with urine spots? There is no reason why you can't be the owner of both a canine who goes outdoors and an attractive yard. But landscaping with dogs in mind does present challenges that may require some compromises. Be prepared to perform a balancing act between what the designer in you wants and what owning this kind of pet requires. Effective landscaping with dogs in mind begins with the recognition on the part of the owner that a business-as-usual approach will not work. If your mutts are to be allowed to run about in the yard, you will probably have to make adjustments in terms of what you have on your property and how you maintain it. These adjustments primarily entail making concessions to your canine friends, as you will see from the strategies below. Either way, if you fail to make some sort of adjustment, then dogs will make a mess of your yard. Worse still, they will be continually dragging dirt into your house. Dogs and lawn grass do not mix well. For small areas, consider switching from a grassy expanse to hardscape. The advantages of hardscape go beyond solutions to landscaping with dogs, since hardscape offers a low-maintenance alternative to grass that obviates lawn care, which can be not only labor intensive but also expensive. Stone and masonry are especially useful for pooch owners because they minimize the mess dogs make through digging, urination, and plain old wear and tear. Make liberal use of crushed stone mulch. If you grow plants in such mulch in a sunny area, select drought-resistant plants, since stone gets hot in the summer. Do not place the stone mulch directly up against the plants. Build a brick patio, a concrete patio or a flagstone patio. But what if you reject the idea of incorporating hardscape, sticking stubbornly to your wish for a "green carpet" of grass? At the very least, consider switching to a different type of grass. Some grasses hold up better to foot traffic, paw traffic, and various other forms of abuse than others. Among the warm-season grasses, Bermuda grass is among the toughest. If you need a cool-season grass for landscaping with dogs, try tall fescue grass. Installing a tougher type of grass will solve only one lawn-care problem encountered in landscaping with dogs: namely, wear and tear on grass. It will do nothing to solve the problem posed by canine urine. Sometimes called "dog spots" or "puppy spots," these are the unsightly yellow stains or "burns" on grass caused by the nitrogen and salts in dog urine. But there is a type of "green carpet" that solves the problem of urine spots: clover. Clover lawns have many advantages over grass lawns. If you are a dog owner, you will especially appreciate the fact that clover does not stain the way grass does after being subjected to canine urine. If you can't bring yourself to renounce the fragile type of grass that your mutt is currently inflicting damage upon, you can still prevent urine spots by vigilance. When you see a dog urinating on the grass, rush to the garden hose. Turn it on and bring it over to the area where your dog has just urinated. Douse the area with water, thereby flushing it and diluting the harmful elements in the urine. One way to keep dogs away from the delicate plants in your yard is by building fences around them, thereby excluding your canine companions. Fenced-in gardens have a charm all their own, enjoying something of a courtyard feel. Wooden picket fences can be especially attractive, as can wooden lattice fences (picture). Plant some perennial flowers behind a white picket fence, and you are well on your way to creating an English country garden that will supply you with endless delight. Alternatively, you could use fencing to create a designated area within which your dog is allowed to roam. Buy a roll of chicken wire, tall enough that your dogs can't jump over it. Drive 4 stakes into the ground around the tree or shrub, about 2 feet away from any foliage or bark. Now measure the perimeter of the square area formed by the stakes. Using that measurement, cut off a length of the wire. Now run the length of wire from stake to stake, tying the wire to the stakes (e.g., with twist-ties). The result is an enclosure that will keep your dog at bay. Note, however, that this strategy represents a severe compromise for your landscaping. Use it only as a last resort. Chicken-wire is not especially attractive. But you could dress up such a wire cage by using decorative posts for your stakes. 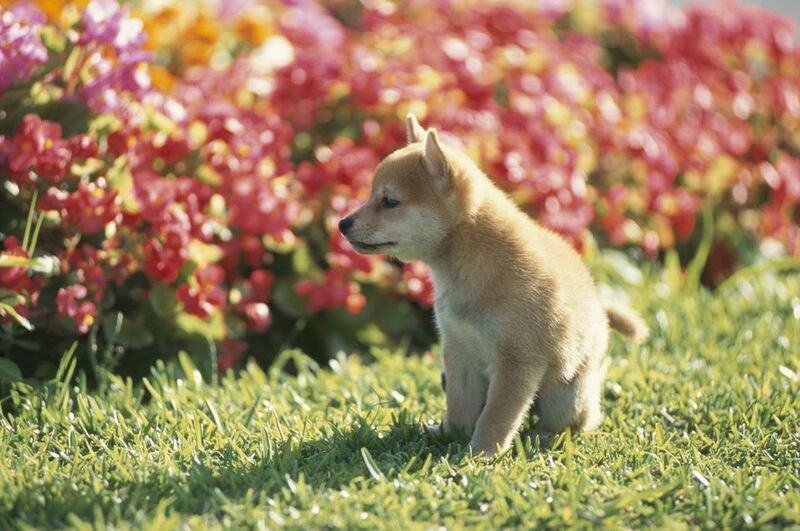 Rather than fighting it, plan your yard around your dog's predictability. Install stone walkways over existing dog paths. Now everyone will be happy: the dog still has its path, and you get to have a better-looking yard. Stone walkways exude charm and are a desirable addition to your landscaping regardless of dog problems. Lastly, consider a strategy that attacks the problem at the dogs' end of it. That is, so far, we have considered tips for adjusting your landscaping so as to accommodate dogs, without giving up the quest for a beautiful yard. Now let's switch perspectives and see what can be done on the dogs' end to solve the problem of urine spotting. One option is to train your dogs so as to restrict their "toilet space" to a designated area. To facilitate clean-up, make sure that designated area has a surface of dirt or gravel. Some have suggested that a change in a dog's diet (for instance, mixing a bit of tomato juice into dog food) may neutralize the harmful elements in canine urine before it ever has a chance to harm your grass. An expensive (but viable) option is to invest in an electric dog fence. In this case, rather than being installed along the whole perimeter of your property, it would be installed in such a way as to keep your mutt confined to a designated area within your yard -- removed from your precious lawn grass. The companies that sell these products send professionals to your yard not only to conduct the installation but also to train your canine friends so that they will quickly adjust to the confinement system. If the plantings in your yard possess any significant degree of diversity, there's a good chance that you're growing poisonous plants -- without even knowing it. You would be surprised at how many of the most common landscape plants and native volunteers contain at least some parts (leaves, berries, etc.) that are toxic. Personally, this does not worry me, as I rarely feel the temptation to nibble on my plants as I stroll through my yard. However, if you have dogs, cats, small children, or an uncontrollable appetite, it behooves you to learn more about poisonous plants.